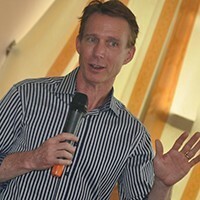 David Ormesher is a co-founder of Bigger Future in Rwanda. Officially launching in January, 2010, David travels to Rwanda four times a year to lead the program, facilitate quarterly workshops, and coach Bigger Future members. As an entrepreneur, David provides leadership and direction for closerlook, inc., a US-based digital marketing agency serving the pharmaceutical industry. As founder and CEO, Ormesher has taken closerlook from a small, creative media boutique and grown it into a recognized leader in creating innovative relationship-marketing solutions that help pharmaceutical brands build and maintain meaningful relationships with their most valuable healthcare professionals. Since founding the company in 1987, David has created a rich, cohesive culture at closerlook by maintaining a hands-on approach to building client success and sustaining lasting account relationships. He has guided the growth and evolution of the firm, attracting a world-class team of account, strategy, user experience, design, technology, data analytics and relationship-marketing services experts. David is a frequent speaker at marketing conferences and a recognized thought leader in the areas of interactive and relationship marketing for the pharmaceutical industry. After three years of being named one of the 100 Most Inspiring Leaders in the life sciences industry, he was recently named one of PharmaVOICE’s magazine’s six inaugural Red Jacket winners for his legacy of leadership, innovation and philanthropy. In addition to his entrepreneurial leadership, David is also active on several non-profit boards. David is president and CEO of the Lyric Opera of Chicago and serves on the boards of the Lurie Children’s Hospital Foundation; the Poetry Foundation; physIQ, an early-stage company providing personalized physiological analytics; i.c.stars, an innovative business and leadership training program for inner city youth; and is a founder of Bigger Future, a social-enterprise building the capacity of high-potential entrepreneurs in Rwanda. He is an angel investor and is active with the tech start-up community in Chicago. He is also an adjunct professor at the Illinois Institute of Technology Stuart School of Business where he teaches Customer Relationship Management. David is married and has three children and makes his home in Chicago, Illinois. David Helmer is Owner and Co-Founder of Helmer Scientific, a global medical device manufacturer and distributor. David aspires to entwine relationship, impact, and generosity in company culture, all while operating in a very competitive business environment. He is a partner in VisionTech Partners, an early stage investment group, and serves on boards of multiple international development and aid organizations. His latest endeavor, Collaborosity, seeks to advance purposeful, global entrepreneurs toward greater capability and contribution. Helmer travels often to East Africa and Ukraine to assist business owners and non-profit leaders in growing organizaitons that flourish in their communities. David received his BSME from the University of Minnesota. He has five daughters and one son, and lives in Indianapolis with his wife, Inessa.